Researchers characterized for the first time the molecular markers that make the brain's front lines of immune defense, the microglia, unique. In the process, they discovered further evidence that microglia may play roles in a variety of neurodegenerative and psychiatric illnesses, including Alzheimer's, Parkinson's, and Huntington's diseases, as well as schizophrenia, autism, and depression. The researchers published their study (“An Environment-Dependent Transcriptional Network Specifies Human Microglia Identity”) in Science. While the link between microglia and a number of disorders has been explored in the past, the new study offers a molecular basis for this connection. Microglia are a type of macrophage, white blood cells found throughout the body that can destroy pathogens or other foreign materials. They're known to be highly responsive to their surroundings and respond to changes in the brain by releasing proinflammatory or anti-inflammatory signals. They also prune back the connections between neurons when cells are damaged or diseased. But microglia are notoriously hard to study. They can't be easily grown in a culture dish and quickly die outside of a living brain. Nicole Coufal, M.D., Ph.D., a pediatric critical care doctor at UC San Diego, who also works in the Gage lab at Salk, wanted to make microglia from stem cells. But she realized there wasn't any way to identify whether the resulting cells were truly microglia. The research team set out to characterize the molecular characteristics of microglia. They worked with neurosurgeons at UC San Diego to collect brain tissue from 19 patients, all of who were having brain surgery for epilepsy, a brain tumor, or a stroke. They isolated microglia from areas of tissue that were unaffected by disease, as well as from mouse brains, and then set out to study the cells. The work was made possible by a multidisciplinary collaboration between bench scientists, bioinformaticians, and clinicians. Microglia, they found, have hundreds of genes that are more highly expressed than other types of macrophages, as well as distinct patterns of gene expression compared to other types of brain cells. 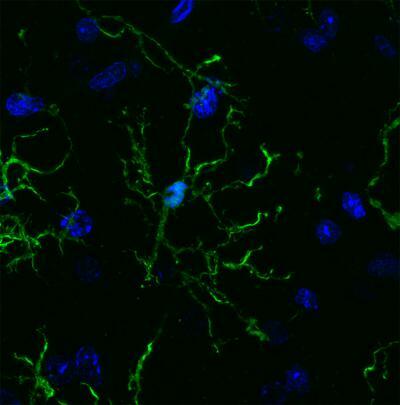 After the cells were cultured, however, the gene patterns of the microglia began to change. Within 6 hours, more than 2000 genes had their expression turned down by at least four-fold. The results underscore how dependent microglia are on their surroundings in the brain, and why researchers have struggled to culture them. In mice, however, many of the disease genes weren't as highly expressed in microglia. “That tells us that maybe mice aren't the best model organisms for some of these diseases,” adds Dr. Coufal. More work is needed to understand exactly how microglia may be altered in people with diseases, but the new molecular profile of microglia offers a way for researchers to begin trying to better culture the cells, or coax stem cells to develop into microglia for future studies, according to the investigators.